U-Factor: Rate of heat loss. The lower the U-Factor, the greater a window's resistance to heat flow and the better its insulating properties. 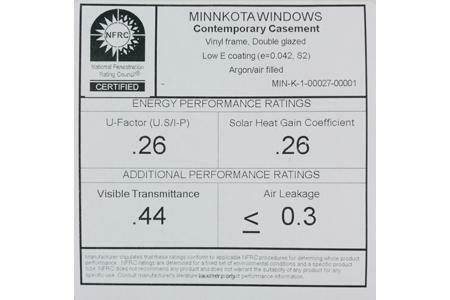 SHGC (Solar Heat Gain Coefficient): The fraction of incident solar radiation admitted through a window. It's expressed as a number between 0 and 1. The lower the SHGC, the less solar heat it transmits. VT (Visible Transmittance): An optical property that indicates the fraction of visible light transmitted through the window. The lower the number, the greater amount of "tint" appearing in the glass. AI (Air Infiltration): The unintentional, or accidental, introduction of outside air into a building, typically through cracks in the building envelope and through use of doors for passage. Also known as air leakage. Number given is a measurement of cubic feet per minute by square feet.